For the seismologist, see Thomas H. Heaton. * Senior club appearances and goals counted for the domestic league only and correct as of 22:27, 21 November 2016 (UTC). Thomas David "Tom" Heaton (born 15 April 1986) is an English professional footballer who plays as a goalkeeper for Premier League club Burnley. Formerly an international from under-16 to under-21 level, Heaton has been involved in senior England squads since 2015, finally making his senior England debut against Australia on 27 May 2016 in a Euro 2016 warm up fixture. Born in Chester, Cheshire, Heaton began his football career with Wrexham, for whom he played both in goal and in midfield, but, after making 20 appearances for the Manchester United Under-17 side in the previous two seasons, he signed for United as a trainee on 8 July 2002. He became a regular in the Under-17 side during the 2002–03 season, and picked up an FA Youth Cup winner's medal despite playing second fiddle to Luke Steele throughout the entire competition. He made his first appearance in the reserve team the following season, starting in a 3–1 home win over Birmingham City in the Premier Reserve League on 2 October 2003. At the end of the 2003–04 season, Heaton was named on the bench for the final of the Manchester Senior Cup against Manchester City, and won a winner's medal despite not taking the field. Heaton's form for the reserves resulted in him being loaned out to Swindon Town at the start of the 2005–06, initially until 1 January 2006. During his time at Swindon, he played over 20 games, saving a penalty on his debut, and was described as "one for the future" by manager Iffy Onuora. He returned to Manchester United, but, after the recall of Ritchie Jones from Royal Antwerp, Heaton was sent there for the rest of the season after United rebuffed an approach from Huddersfield Town. Heaton spent the 2007–08 season with the first team squad at Manchester United, appearing on the bench when Edwin van der Sar was out due to injury. At the end of the 2007–08 season, Heaton agreed to move to Championship club Cardiff City on loan for the duration of the 2008–09 season. He was chosen as the club's first choice goalkeeper, above Peter Enckelman, for the start of the season by manager Dave Jones. He played in every match until late November, with the exception of the Carling Cup third round tie against Swansea City, when he was replaced by Enckelman. However, late on in Cardiff's 2–1 away defeat to Plymouth Argyle on 22 November 2008, Heaton picked up an injury and was forced off. The injury would go on to cost Heaton his place in the side as the club went unbeaten with Enckelman in goal for over two months. After returning from Queens Park Rangers, Heaton joined Rochdale on 13 November 2009 until the end of December 2009. He made his debut in a 3–2 loss against Chesterfield on 14 November 2009. The loan was then extended until 23 January 2010, before a further extension pushed the end date back to 31 January. In his 12 appearances for Rochdale, Heaton conceded only 10 goals – including four clean sheets – and finished on the losing side just once. Heaton spent less than two weeks back at Manchester United before going back out on loan to Wycombe Wanderers on 12 February 2010. He went straight into the Wycombe starting line-up for their away match against Brentford the following day, which they drew 1–1. Heaton made his second appearance for the Chairboys in their 0–0 draw against Southampton on Tuesday 23 February 2010. Where he made a great save from a volley to keep the Chairboys on even terms with the Saints. Meeting with Manchester United manager Sir Alex Ferguson on his future at the club amidst an expiring contract, Heaton declined an offer to stay at Old Trafford, deciding instead to leave on free transfer in pursuit of regular playing time. Following his release by Manchester United, Heaton agreed a deal on 15 June 2010 to return to Cardiff City on 1 July 2010. He made his second debut in 4–1 win over Burton Albion in the League Cup on 11 August. After number 1, David Marshall suffered an elbow injury, Heaton established himself as Cardiff's new number 1. But in late February, he suffered a groin injury, so Jason Brown and Stephen Bywater were brought in as cover on loan. Upon his return, Heaton went into the side against Derby County, where they won 4–1, their first win in four games. Heaton's performances during the 2010–11 season, earned him the club's Young Player of the Year award. Under new manager, Malky Mackay, Heaton found himself as cover for David Marshall, but he played a key part in the club's League Cup run in which they reached the final thanks to two saves from Heaton in a semi-final penalty shootout against Crystal Palace. He suffered an ankle injury just before the final, but he overcame the injury to start at Wembley Stadium. Heaton followed his penalty heroics against Crystal Palace when he started the penalty shootout by pushing Steven Gerrard's effort onto the bar, but he ultimately ended up on the losing side as Liverpool won the shootout 3–2. Despite the successful cup run, Heaton still found himself second string to Marshall and was released at the end of the season after rejecting a new contract in the Welsh capital. In July 2012, Heaton held talks with Watford over a potential move; however, Watford's new owners decided to pull out of the move. Later that month, Heaton went on trial with Bristol City during their pre-season training camp in Spain and they opened contract talks soon after. On 27 July, Heaton signed a one-year deal with the club, with the option for a further 12 months. He made his debut on 18 August 2012, in a 1–0 defeat away to Nottingham Forest. A disappointing season in Bristol led to the club owning the worst defensive record in the league with 84 goals allowed, and they were relegated at the end of the season. Heaton started 43 of The Robins' 46 matches in the Championship that season, and was viewed as one the club's better players that season. Heaton joined Burnley in May 2013, after turning down a further one-year deal at Bristol City. His decision was to stay in the Championship, and Burnley offered Heaton a two-year contract attaching him to the club until June 2015, with an option of a third year. A target of manager Sean Dyche while at Watford, Dyche's first Burnley signing was described as a "good technician" with a "great pedigree". Heaton was immediately inserted as first choice goalkeeper for Dyche following the departures of Lee Grant and Brian Jensen. 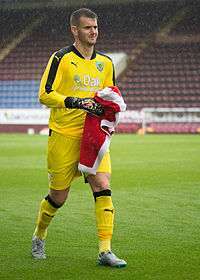 Heaton made his Burnley debut against Bolton on 3 August 2013. On 24 August, he was the recipient of a rare technical second caution for handling the ball once releasing it in his own area whilst playing against Brighton, a game they lost 2–0. As a result, Heaton was suspended for Burnley's second round Capital One Cup match against Preston. Heaton was a part of Burnley's defense which allowed only 37 goals, fewest in the league, as Burnley returned to the Premier League for the first time since 2009–10. Heaton also picked up 19 clean sheets, the most by any keeper in the regular season. Heaton made his Premier League debut on 18 August against Chelsea in a 1–3 loss. Heaton played in every minute of Burnley's Premier League campaign, the only goalkeeper to do so, but his efforts would not be enough, as Burnley and their league-worst offense were relegated at the end of the season. After the season, Heaton was voted by his teammates as Burnley's Player of the Season. On 30 June 2015, Heaton signed a new three-year deal at the club, therefore keeping him there until the summer of 2018. Taking over for Jason Shackell, Heaton was named as captain for the 2015–16 season, captaining the side for the first time on 8 August 2015, on the opening day of the 2015–16 Football League Championship season against Leeds United in a 1–1 draw. Heaton kept 20 clean sheets during the season, second only to Dimitrios Konstantopoulos of Middlesbrough, as Burnley did not lose in 2016 in the Championship on their way to becoming champions and earning immediate promotion to the Premier League. Toward the end of the season, Heaton was named to the PFA Championship Team of the Year. On 20 July 2016, Heaton signed another new contract, this time a four-year deal running until the summer of 2020. On 29 October, Heaton made numerous saves during the match against former club Manchester United, the highlight being a mid-air, fully extended save of Zlatan Ibrahimović that Heaton claimed "nearly broke [his] arm". Afterwards, Heaton required medical attention, but remained in the game to lead Burnley to a 0–0 draw, earning Man of the Match in the process. On 21 May 2015, Heaton was called up to the England senior team for the first time ahead of a friendly against the Republic of Ireland and a UEFA Euro 2016 qualifying match against Slovenia. Heaton continued to be included in Roy Hodgson's squads before finally making his debut as an 87th-minute substitute in place of Fraser Forster in England's Euro 2016 warm up match against Australia at Sunderland's Stadium of Light. 1 2 3 4 Hugman, Barry J., ed. (2010). The PFA Footballers' Who's Who 2010–11. Edinburgh: Mainstream Publishing. p. 192. ISBN 978-1-84596-601-0. ↑ "Tom Heaton Player Profile - ESPN FC". www.espnfc.co.uk. Retrieved 2016-07-30. ↑ "Cardiff sign Man Utd goalkeeper". BBC Sport. 23 May 2008. Retrieved 2008-05-23. ↑ Phillips, Terry (8 August 2008). "Heaton wins Bluebirds keeper battle for Saints start". Western Mail. Cardiff. Retrieved 29 August 2008. ↑ "Swansea 1–0 Cardiff". BBC Sport. 23 September 2008. Retrieved 18 February 2009. ↑ "Cardiff rocked by keeper injury". BBC Sport. 18 February 2009. Retrieved 18 February 2009. ↑ "Cardiff City set to offer skipper's armband to Roger Johnson". South Wales Echo (Cardiff). Retrieved on 15 May 2009. ↑ "Exclusive: United Keeper Pens Loan". Queens Park Rangers F.C. 15 August 2009. Archived from the original on 6 March 2012. Retrieved 15 August 2009. 1 2 3 4 5 6 7 8 "Games played by Tom Heaton in 2009/2010". Soccerbase. Centurycomm. Retrieved 27 April 2016. ↑ "Heaton makes Dale switch". Sky Sports. 13 November 2009. Retrieved 13 November 2009. ↑ "Keeping Heaton On". Rochdale A.F.C. 28 December 2009. Archived from the original on 23 July 2011. Retrieved 7 January 2010. ↑ "Keeper Extends Loan". Rochdale A.F.C. 25 January 2010. Archived from the original on 28 January 2010. Retrieved 25 January 2010. ↑ "Wycombe sign keeper Tom Heaton from Manchester United". BBC Sport. 12 February 2010. Retrieved 12 February 2010. ↑ "Brentford 1–1 Wycombe". BBC Sport. 13 February 2010. Retrieved 13 February 2010. ↑ Hytner, David (19 August 2016). "Burnley's Tom Heaton: 'It got heated for a minute or two with Alex Ferguson'". The Guardian. ↑ "Man Utd goalkeeper Tom Heaton returns to Cardiff City". BBC Sport. 15 June 2010. Retrieved 15 June 2010. 1 2 3 "Games played by Tom Heaton in 2010/2011". Soccerbase. Centurycomm. Retrieved 27 April 2016. ↑ "Blackburn keeper Jason Brown completes Cardiff loan". BBC Sport. 3 March 2011. Retrieved 3 March 2011. ↑ "Goalkeeper Tom Heaton fitness boost for Cardiff City". BBC Sport. 1 April 2011. Retrieved 1 April 2011. ↑ "Player of the Year Awards. The Winners". Cardiff City F.C. 30 April 2011. Retrieved 30 April 2011. 1 2 "Games played by Tom Heaton in 2011/2012". Soccerbase. Centurycomm. Retrieved 27 April 2016. ↑ "Cardiff 2–2 Liverpool". BBC Sport. 26 February 2012. Retrieved 5 March 2012. ↑ "Tom Heaton, Lee Naylor and Paul Quinn leave Cardiff City". BBC Sport. 14 May 2012. Retrieved 14 May 2012. ↑ "Hornets drop Heaton deal". Sky Sports. 5 July 2012. Retrieved 5 July 2012. ↑ "City in Heaton talks". Sky Sports. 23 July 2012. Retrieved 23 July 2012. ↑ "Bristol City sign ex-Cardiff City goalkeeper Tom Heaton". BBC Sport. 27 July 2012. Retrieved 27 July 2012. ↑ "Nott'm Forest 1–0 Bristol City". BBC Sport. 18 August 2012. Retrieved 18 September 2012. ↑ "Tom Heaton was a great professional to work with, says Sean O'Driscoll". The Bristol Post. 20 May 2013. ↑ "Bristol City goalkeeper Tom Heaton not ruling out staying at Ashton Gate". Sky Sports. 23 April 2013. ↑ "Burnley: Bristol City keeper Tom Heaton to join Clarets". BBC Sport. 17 May 2013. ↑ "Dyche Delight at Heaton Signing". Burnley Football Club. 17 May 2013. ↑ "Brighton 2-0 Burnley". BBC Sport. ↑ Luttrell, Alex (29 August 2013). "Tasmanian goalkeeper Alex Cisak has debut to treasure with clean sheet for Burnley in the Capital One Cup". The Mercury. ↑ Taylor, Daniel (18 August 2014). "Cesc Fábregas inspires Chelsea to opening Premier League win at Burnley". The Guardian. ↑ "2014-15 Premier League Goalkeeper Stats". Barrie's View. 25 May 2015. ↑ "Clarets Player of the Year Awards 2015". Burnley Football Club. 25 May 2015. ↑ "Heaton Signs New Clarets Contract". Burnley F.C. 30 June 2015. ↑ "United in opening day draw". Leeds United F.C. 8 August 2015. Retrieved 8 August 2015. ↑ Green, Jim (25 April 2016). "Tom Heaton named in PFA Championship Team of the Year". Chester Chronicle. ↑ "Skipper Heaton Signs New Four Year Deal". Burnley Football Club. 20 July 2016. ↑ Mendola, Nicholas (29 October 2016). ""Nearly broke my arm" – Heaton on stunning Zlatan save, day". NBC Sports. ↑ "Manchester United 0-0 Burnley". BBC Sports. 29 October 2016. ↑ "City new boy wants to be number one with United". South Wales Echo (Cardiff). Retrieved on 13 June 2008. ↑ "England: Jamie Vardy, Charlie Austin & Tom Heaton in squad". BBC Sport. 21 May 2015. Retrieved 21 May 2015. ↑ "Burnley captain Tom Heaton makes his England debut". 1 2 "Games played by Tom Heaton in 2005/2006". Soccerbase. Centurycomm. Retrieved 27 April 2016. ↑ "Games played by Tom Heaton in 2006/2007". Soccerbase. Centurycomm. Retrieved 27 April 2016. ↑ "Games played by Tom Heaton in 2007/2008". Soccerbase. Centurycomm. Retrieved 27 April 2016. 1 2 "Games played by Tom Heaton in 2008/2009". Soccerbase. Centurycomm. Retrieved 27 April 2016. ↑ "Spelersprofiel". R.A.F.C.-Museum (in Dutch). Royal Antwerp F.C. Retrieved 27 April 2016. ↑ "Games played by Tom Heaton in 2012/2013". Soccerbase. Centurycomm. Retrieved 27 April 2016. ↑ "Games played by Tom Heaton in 2013/2014". Soccerbase. Centurycomm. Retrieved 27 April 2016. ↑ "Games played by Tom Heaton in 2014/2015". Soccerbase. Centurycomm. Retrieved 27 April 2016. ↑ "Games played by Tom Heaton in 2015/2016". Soccerbase. Centurycomm. Retrieved 29 May 2016. ↑ "Games played by Tom Heaton in 2016/2017". Soccerbase. Centurycomm. Retrieved 11 October 2016. ↑ "Heaton, Tom". National Football Teams. Retrieved 29 May 2016. ↑ "T. Heaton". Soccerway. Perform Group. Retrieved 16 May 2016. Wikimedia Commons has media related to Tom Heaton.